This article is about the physical phenomenon. For other uses, see Nuclear magnetic resonance spectroscopy. "NMR" redirects here. For other uses, see NMR (disambiguation). Bruker 700 MHz nuclear magnetic resonance (NMR) spectrometer. Nuclear magnetic resonance (NMR) is a physical phenomenon in which nuclei in a strong static magnetic field are perturbed by a weak oscillating magnetic field (in the near field and therefore not involving electromagnetic waves) and respond by producing an electromagnetic signal with a frequency characteristic of the magnetic field at the nucleus. This process occurs near resonance, when the oscillation frequency matches the intrinsic frequency of the nuclei, which depends on the strength of the static magnetic field, the chemical environment, and the magnetic properties of the isotope involved; in practical applications with static magnetic fields up to ca. 20 tesla, the frequency is similar to VHF and UHF television broadcasts (60–1000 MHz). NMR results from specific magnetic properties of certain atomic nuclei. Nuclear magnetic resonance spectroscopy is widely used to determine the structure of organic molecules in solution and study molecular physics, crystals as well as non-crystalline materials. NMR is also routinely used in advanced medical imaging techniques, such as in magnetic resonance imaging (MRI). , although isotopes of many other elements can be studied by high-field NMR spectroscopy as well. A key feature of NMR is that the resonance frequency of a particular simple substance is usually directly proportional to the strength of the applied magnetic field. It is this feature that is exploited in imaging techniques; if a sample is placed in a non-uniform magnetic field then the resonance frequencies of the sample's nuclei depend on where in the field they are located. Since the resolution of the imaging technique depends on the magnitude of the magnetic field gradient, many efforts are made to develop increased gradient field strength. The alignment (polarization) of the magnetic nuclear spins in an applied, constant magnetic field B0. The perturbation of this alignment of the nuclear spins by a weak oscillating magnetic field, usually referred to as a radio-frequency (RF) pulse. The oscillation frequency required for significant perturbation is dependent upon the static magnetic field (B0) and the nuclei of observation. The detection of the NMR signal during or after the RF pulse, due to the voltage induced in a detection coil by precession of the nuclear spins around B0. After an RF pulse, precession usually occurs with the nuclei's intrinsic Larmor frequency and, in itself, does not involve transitions between spin states or energy levels. The two magnetic fields are usually chosen to be perpendicular to each other as this maximizes the NMR signal strength. The frequencies of the time-signal response by the total magnetization (M) of the nuclear spins are analyzed in NMR spectroscopy and magnetic resonance imaging. Both use applied magnetic fields (B0) of great strength, often produced by large currents in superconducting coils, in order to achieve dispersion of response frequencies and of very high homogeneity and stability in order to deliver spectral resolution, the details of which are described by chemical shifts, the Zeeman effect, and Knight shifts (in metals). The information provided by NMR can also be increased using hyperpolarization, and/or using two-dimensional, three-dimensional and higher-dimensional techniques. NMR phenomena are also utilized in low-field NMR, NMR spectroscopy and MRI in the Earth's magnetic field (referred to as Earth's field NMR), and in several types of magnetometers. Nuclear magnetic resonance was first described and measured in molecular beams by Isidor Rabi in 1938, by extending the Stern–Gerlach experiment, and in 1944, Rabi was awarded the Nobel Prize in Physics for this work. In 1946, Felix Bloch and Edward Mills Purcell expanded the technique for use on liquids and solids, for which they shared the Nobel Prize in Physics in 1952. Yevgeny Zavoisky likely observed nuclear magnetic resonance in 1941, well before Felix Bloch and Edward Mills Purcell, but dismissed the results as not reproducible. Russell H. Varian filed the "Method and means for correlating nuclear properties of atoms and magnetic fields", U.S. Patent 2,561,490 on July 24, 1951. 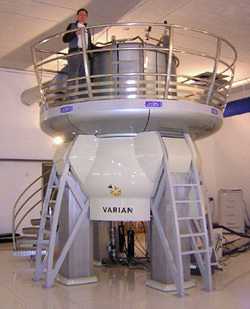 Varian Associates developed the first NMR unit called NMR HR-30 in 1952. Purcell had worked on the development of radar during World War II at the Massachusetts Institute of Technology's Radiation Laboratory. His work during that project on the production and detection of radio frequency power and on the absorption of such RF power by matter laid the foundation for his discovery of NMR in bulk matter. , could absorb RF energy when placed in a magnetic field and when the RF was of a frequency specific to the identity of the nuclei. When this absorption occurs, the nucleus is described as being in resonance. Different atomic nuclei within a molecule resonate at different (radio) frequencies for the same magnetic field strength. The observation of such magnetic resonance frequencies of the nuclei present in a molecule allows any trained user to discover essential chemical and structural information about the molecule. The development of NMR as a technique in analytical chemistry and biochemistry parallels the development of electromagnetic technology and advanced electronics and their introduction into civilian use. particles and hence fermions), giving zero overall spin. nucleus has an overall spin value S = ​5⁄2. are nuclides that do exhibit NMR spectra. The last two nuclei have spin S > 1/2 and are therefore quadrupolar nuclei. Electron spin resonance (ESR) is a related technique in which transitions between electronic rather than nuclear spin levels are detected. The basic principles are similar but the instrumentation, data analysis, and detailed theory are significantly different. Moreover, there is a much smaller number of molecules and materials with unpaired electron spins that exhibit ESR (or electron paramagnetic resonance (EPR)) absorption than those that have NMR absorption spectra. On the other hand, ESR has much higher signal per spin than NMR does. Nuclear spin is an intrinsic angular momentum that is quantized. This means that the magnitude of this angular momentum is quantized (i.e. S can only take on a restricted range of values), and also that the x, y, and z-components of the angular momentum are quantized, being restricted to integer or half-integer multiples of ħ. The integer or half-integer quantum number associated with the spin component along the z-axis or the applied magnetic field is known as the magnetic quantum number, m, and can take values from +S to −S, in integer steps. Hence for any given nucleus, there are a total of 2S + 1 angular momentum states. An intuitive model. Nuclei with spin have a magnetic moments (spin magnetic moments). By itself, there is no energetic difference for any particular orientation of the nuclear magnet (only one energy state, on the left), but in an external magnetic field there is a high-energy state and a low-energy state depending on the relative orientation of the magnet to the external field, and in thermal equilibrium, the low-energy orientation is preferred. The average orientation of the magnetic moment will precess around the field. The external field can be supplied by a large magnet and also by other nuclei in the vicinity.
. Each nucleus has two linearly independent spin states, with m = 1/2 or m = −1/2 (also referred to as spin-up and spin-down, or sometimes α and β spin states, respectively) for the z-component of spin. In the absence of a magnetic field, these states are degenerate; that is, they have the same energy. Hence the number of nuclei in these two states will be essentially equal at thermal equilibrium. As a result, the different nuclear spin states have different energies in a non-zero magnetic field. In less formal language, we can talk about the two spin states of a spin 1/2 as being aligned either with or against the magnetic field. If γ is positive (true for most isotopes used in NMR) then m = 1/2 is the lower energy state. and this results in a small population bias favoring the lower energy state in thermal equilibrium. With more spins pointing up than down, a net spin magnetization along the magnetic field B0 results. without change in the populations of the energy levels because energy is constant (time-independent Hamiltonian). A perturbation of nuclear spin orientations from equilibrium will occur only when an oscillating magnetic field is applied whose frequency νrf sufficiently closely matches the Larmor precession frequency νL of the nuclear magnetization. The populations of the spin-up and -down energy levels then undergo Rabi oscillations, which are analyzed most easily in terms of precession of the spin magnetization around the effective magnetic field in a reference frame rotating with the frequency νrf. The stronger the oscillating field, the faster the Rabi oscillations or the precession around the effective field in the rotating frame. After a certain time on the order of 2-1000 microseconds, a resonant RF pulse flips the spin magnetization to the transverse plane, i.e. it makes an angle of 90o with the constant magnetic field B0 ("90o pulse"), while after a twice longer time, the initial magnetization has been inverted ("180o pulse"). It is the transverse magnetization generated by a resonant oscillating field which is usually detected in NMR, during application of the relatively weak RF field in old-fashioned continuous-wave NMR, or after the relatively strong RF pulse in modern pulsed NMR. It might appear from the above that all nuclei of the same nuclide (and hence the same γ) would resonate at exactly the same frequency. This is not the case. The most important perturbation of the NMR frequency for applications of NMR is the "shielding" effect of the surrounding shells of electrons. Electrons, similar to the nucleus, are also charged and rotate with a spin to produce a magnetic field opposite to the applied magnetic field. In general, this electronic shielding reduces the magnetic field at the nucleus (which is what determines the NMR frequency). As a result, the frequency required to achieve resonance is also reduced. This shift in the NMR frequency due to the electronic molecular orbital coupling to the external magnetic field is called chemical shift, and it explains why NMR is able to probe the chemical structure of molecules, which depends on the electron density distribution in the corresponding molecular orbitals. If a nucleus in a specific chemical group is shielded to a higher degree by a higher electron density of its surrounding molecular orbital, then its NMR frequency will be shifted "upfield" (that is, a lower chemical shift), whereas if it is less shielded by such surrounding electron density, then its NMR frequency will be shifted "downfield" (that is, a higher chemical shift). Unless the local symmetry of such molecular orbitals is very high (leading to "isotropic" shift), the shielding effect will depend on the orientation of the molecule with respect to the external field (B0). In solid-state NMR spectroscopy, magic angle spinning is required to average out this orientation dependence in order to obtain frequency values at the average or isotropic chemical shifts. This is unnecessary in conventional NMR investigations of molecules in solution, since rapid "molecular tumbling" averages out the chemical shift anisotropy (CSA). In this case, the "average" chemical shift (ACS) or isotropic chemical shift is often simply referred to as the chemical shift. Visualization of the T1 and T2 relaxation times. The process of population relaxation refers to nuclear spins that return to thermodynamic equilibrium in the magnet. This process is also called T1, "spin-lattice" or "longitudinal magnetic" relaxation, where T1 refers to the mean time for an individual nucleus to return to its thermal equilibrium state of the spins. After the nuclear spin population has relaxed, it can be probed again, since it is in the initial, equilibrium (mixed) state. The precessing nuclei can also fall out of alignment with each other and gradually stop producing a signal. This is called T2 or transverse relaxation. Because of the difference in the actual relaxation mechanisms involved (for example, intermolecular versus intramolecular magnetic dipole-dipole interactions ), T1 is usually (except in rare cases) longer than T2 (that is, slower spin-lattice relaxation, for example because of smaller dipole-dipole interaction effects). In practice, the value of T2* which is the actually observed decay time of the observed NMR signal, or free induction decay (to 1/e of the initial amplitude immediately after the resonant RF pulse), also depends on the static magnetic field inhomogeneity, which is quite significant. (There is also a smaller but significant contribution to the observed FID shortening from the RF inhomogeneity of the resonant pulse). In the corresponding FT-NMR spectrum—meaning the Fourier transform of the free induction decay—the T2* time is inversely related to the width of the NMR signal in frequency units. Thus, a nucleus with a long T2 relaxation time gives rise to a very sharp NMR peak in the FT-NMR spectrum for a very homogeneous ("well-shimmed") static magnetic field, whereas nuclei with shorter T2 values give rise to broad FT-NMR peaks even when the magnet is shimmed well. Both T1 and T2 depend on the rate of molecular motions as well as the gyromagnetic ratios of both the resonating and their strongly interacting, next-neighbor nuclei that are not at resonance. A Hahn echo decay experiment can be used to measure the dephasing time, as shown in the animation below. The size of the echo is recorded for different spacings of the two pulses. This reveals the decoherence which is not refocused by the 180° pulse. In simple cases, an exponential decay is measured which is described by the T2 time. NMR spectroscopy is one of the principal techniques used to obtain physical, chemical, electronic and structural information about molecules due to the chemical shift of the resonance frequencies of the nuclear spins in the sample. Peak splittings due to J- or dipolar couplings between nuclei are also useful. NMR spectroscopy can provide detailed and quantitative information on the functional groups, topology, dynamics and three-dimensional structure of molecules in solution and the solid state. Since the area under an NMR peak is usually proportional to the number of spins involved, peak integrals can be used to determine composition quantitatively. Structure and molecular dynamics can be studied (with or without "magic angle" spinning (MAS)) by NMR of quadrupolar nuclei (that is, with spin S > 1/2) even in the presence of magnetic "dipole-dipole" interaction broadening (or simply, dipolar broadening) which is always much smaller than the quadrupolar interaction strength because it is a magnetic vs. an electric interaction effect.
. Furthermore, nuclear magnetic resonance is one of the techniques that has been used to design quantum automata, and also build elementary quantum computers. In the first few decades of nuclear magnetic resonance, spectrometers used a technique known as continuous-wave (CW) spectroscopy, where the transverse spin magnetization generated by a weak oscillating magnetic field is recorded as a function of the oscillation frequency or static field strength B0. When the oscillation frequency matches the nuclear resonance frequency, the transverse magnetization is maximized and a peak is observed in the spectrum. Although NMR spectra could be, and have been, obtained using a fixed constant magnetic field and sweeping the frequency of the oscillating magnetic field, it was more convenient to use a fixed frequency source and vary the current (and hence magnetic field) in an electromagnet to observe the resonant absorption signals. This is the origin of the counterintuitive, but still common, "high field" and "low field" terminology for low frequency and high frequency regions, respectively, of the NMR spectrum. CW spectroscopy is inefficient in comparison with Fourier analysis techniques (see below) since it probes the NMR response at individual frequencies or field strengths in succession. Since the NMR signal is intrinsically weak, the observed spectrum suffers from a poor signal-to-noise ratio. This can be mitigated by signal averaging, i.e. adding the spectra from repeated measurements. While the NMR signal is the same in each scan and so adds linearly, the random noise adds more slowly – proportional to the square root of the number of spectra (see random walk). Hence the overall signal-to-noise ratio increases as the square-root of the number of spectra measured. Most applications of NMR involve full NMR spectra, that is, the intensity of the NMR signal as a function of frequency. Early attempts to acquire the NMR spectrum more efficiently than simple CW methods involved illuminating the target simultaneously with more than one frequency. A revolution in NMR occurred when short radio-frequency pulses began to be used, with a frequency centered at the middle of the NMR spectrum. In simple terms, a short pulse of a given "carrier" frequency "contains" a range of frequencies centered about the carrier frequency, with the range of excitation (bandwidth) being inversely proportional to the pulse duration, i.e. the Fourier transform of a short pulse contains contributions from all the frequencies in the neighborhood of the principal frequency. The restricted range of the NMR frequencies made it relatively easy to use short (1 - 100 microsecond) radio frequency pulses to excite the entire NMR spectrum. Richard R. Ernst was one of the pioneers of pulsed NMR and won a Nobel Prize in chemistry in 1991 for his work on Fourier Transform NMR and his development of multi-dimensional NMR spectroscopy. The use of pulses of different durations, frequencies, or shapes in specifically designed patterns or pulse sequences allows the NMR spectroscopist to extract many different types of information about the molecules in the sample. In multi-dimensional nuclear magnetic resonance spectroscopy, there are at least two pulses and, as the experiment is repeated, the pulse timings are systematically varied and the oscillations of the spin system are probed point by point in the time domain. Multidimensional Fourier transformation of the multidimensional time signal yields the multidimensional spectrum. In two-dimensional nuclear magnetic resonance there will be one systematically varied time period in the sequence of pulses, which will modulate the intensity or phase of the detected signals. In 3D NMR, two time periods will be varied independently, and in 4D NMR, three will be varied. The remaining "dimension" is always provided by the directly detected signal. There are many such experiments. In some, fixed time intervals allow (among other things) magnetization transfer between nuclei and, therefore, the detection of the kinds of nuclear-nuclear interactions that allowed for the magnetization transfer. Interactions that can be detected are usually classified into two kinds. There are through-bond and through-space interactions, the latter being a consequence of dipolar couplings in solid-state NMR and of the nuclear Overhauser effect in solution NMR. Experiments of the nuclear Overhauser variety may be employed to establish distances between atoms, as for example by 2D-FT NMR of molecules in solution. Although the fundamental concept of 2D-FT NMR was proposed by Jean Jeener from the Free University of Brussels at an international conference, this idea was largely developed by Richard Ernst who won the 1991 Nobel prize in Chemistry for his work in FT NMR, including multi-dimensional FT NMR, and especially 2D-FT NMR of small molecules. Multi-dimensional FT NMR experiments were then further developed into powerful methodologies for studying molecules in solution, in particular for the determination of the structure of biopolymers such as proteins or even small nucleic acids. In 2002 Kurt Wüthrich shared the Nobel Prize in Chemistry (with John Bennett Fenn and Koichi Tanaka) for his work with protein FT NMR in solution. This technique complements X-ray crystallography in that it is frequently applicable to molecules in an amorphous or liquid-crystalline state, whereas crystallography, as the name implies, is performed on molecules in a crystalline phase. In electronically conductive materials, the Knight shift of the resonance frequency can provide information on the mobile charge carriers. Though nuclear magnetic resonance is used to study the structure of solids, extensive atomic-level structural detail is more challenging to obtain in the solid state. Due to broadening by chemical shift anisotropy (CSA) and dipolar couplings to other nuclear spins, without special techniques such as MAS or dipolar decoupling by RF pulses, the observed spectrum is often only a broad Gaussian band for non-quadrupolar spins in a solid. Professor Raymond Andrew at the University of Nottingham in the UK pioneered the development of high-resolution solid-state nuclear magnetic resonance. He was the first to report the introduction of the MAS (magic angle sample spinning; MASS) technique that allowed him to achieve spectral resolution in solids sufficient to distinguish between chemical groups with either different chemical shifts or distinct Knight shifts. In MASS, the sample is spun at several kilohertz around an axis that makes the so-called magic angle θm (which is ~54.74°, where 3cos2θm-1 = 0) with respect to the direction of the static magnetic field B0; as a result of such magic angle sample spinning, the broad chemical shift anisotropy bands are averaged to their corresponding average (isotropic) chemical shift values. Correct alignment of the sample rotation axis as close as possible to θm is essential for cancelling out the chemical-shift anisotropy broadening. There are different angles for the sample spinning relative to the applied field for the averaging of electric quadrupole interactions and paramagnetic interactions, correspondingly ~30.6° and ~70.1°. In amorphous materials, residual line broadening remains since each segment is in a slightly different environment, therefore exhibiting a slightly different NMR frequency. Dipolar and J-couplings to nearby 1H nuclei are usually removed by radio-frequency pulses applied at the 1H frequency during signal detection. The concept of cross polarization developed by Sven Hartmann and Erwin Hahn was utilized in transferring magnetization from protons to less sensitive nuclei by M.G. Gibby, Alex Pines and John S. Waugh. Then, Jake Schaefer and Ed Stejskal demonstrated the powerful use of cross polarization under MAS conditions (CP-MAS) and proton decoupling, which is now routinely employed to measure high resolution spectra of low-abundance and low-sensitivity nuclei, such as carbon-13, silicon-29, or nitrogen-15, in solids. Significant further signal enhancement can be achieved by dynamic nuclear polarization from unpaired electrons to the nuclei, usually at temperatures near 110 K.
Because the intensity of nuclear magnetic resonance signals and, hence, the sensitivity of the technique depends on the strength of the magnetic field the technique has also advanced over the decades with the development of more powerful magnets. Advances made in audio-visual technology have also improved the signal-generation and processing capabilities of newer instruments. As noted above, the sensitivity of nuclear magnetic resonance signals is also dependent on the presence of a magnetically susceptible nuclide and, therefore, either on the natural abundance of such nuclides or on the ability of the experimentalist to artificially enrich the molecules, under study, with such nuclides. The most abundant naturally occurring isotopes of hydrogen and phosphorus (for example) are both magnetically susceptible and readily useful for nuclear magnetic resonance spectroscopy. In contrast, carbon and nitrogen have useful isotopes but which occur only in very low natural abundance. Increasing temperature, which evens out the population of states. Conversely, low temperature NMR can sometimes yield better results than room-temperature NMR, providing the sample remains liquid. Saturation of the sample with energy applied at the resonant radiofrequency. This manifests in both CW and pulsed NMR; in the first case (CW) this happens by using too much continuous power that keeps the upper spin levels completely populated; in the second case (pulsed), each pulse (that is at least a 90° pulse) leaves the sample saturated, and four to five times the (longitudinal) relaxation time (5T1) must pass before the next pulse or pulse sequence can be applied. For single pulse experiments, shorter RF pulses that tip the magnetization by less than 90° can be used, which loses some intensity of the signal, but allows for shorter recycle delays. The optimum there is called an Ernst angle, after the Nobel laureate. Especially in solid state NMR, or in samples containing very few nuclei with spin (diamond with the natural 1% of carbon-13 is especially troublesome here) the longitudinal relaxation times can be on the range of hours, while for proton-NMR they are more in the range of one second. Many isotopes of chemical elements can be used for NMR analysis. signal has been the sole diagnostic nucleus used for clinical magnetic resonance imaging.
. Deuterium resonance is commonly used in high-resolution NMR spectroscopy to monitor drifts in the magnetic field strength (lock) and to improve the homogeneity of the external magnetic field.
. It is used mainly in studies of endohedral fullerenes, where its chemical inertness is beneficial to ascertaining the structure of the entrapping fullerene. , yields sharper signals. Quartz tubes must be used as borosilicate glass interferes with measurement. takes a long time. Frequently used for labeling of compounds in synthetic and metabolic studies. Has low sensitivity and moderately wide chemical shift range, yields sharp signals. Low percentage makes it useful by preventing spin-spin couplings and makes the spectrum appear less crowded. Slow relaxation means that spectra are not integrable unless long acquisition times are used. , spin-1, medium sensitivity nucleus with wide chemical shift. Its large quadrupole moment interferes in acquisition of high resolution spectra, limiting usefulness to smaller molecules and functional groups with a high degree of symmetry such as the headgroups of lipids. , spin-1/2, relatively commonly used. Can be used for labeling compounds. Nucleus very insensitive but yields sharp signals. Low percentage in natural nitrogen together with low sensitivity requires high concentrations or expensive isotope enrichment. , spin-5/2, low sensitivity and very low natural abundance (0.037%), wide chemical shift range (up to 2000 ppm). Quadrupole moment causing line broadening. Used in metabolic and biochemical studies in studies of chemical equilibria. , spin-1/2, relatively commonly measured. Sensitive, yields sharp signals, has a wide chemical shift range. , spin-1/2, 100% of natural phosphorus. Medium sensitivity, wide chemical shifts range, yields sharp lines. Spectra tend to have a moderate amount of noise. Used in biochemical studies and in coordination chemistry where phosphorus containing ligands are involved. despite its slightly broader signal. Organic chlorides yield very broad signals. Its use is limited to inorganic and ionic chlorides and very small organic molecules. , used in biochemistry to study calcium binding to DNA, proteins, etc. Moderately sensitive, very low natural abundance. , used in studies of catalysts and complexes. NMR is extensively used in medicine in the form of magnetic resonance imaging. NMR is used industrially mainly for routine analysis of chemicals. The technique is also used, for example, to measure the ratio between water and fat in foods, monitor the flow of corrosive fluids in pipes, or to study molecular structures such as catalysts. The application of nuclear magnetic resonance best known to the general public is magnetic resonance imaging for medical diagnosis and magnetic resonance microscopy in research settings. However, it is also widely used in biochemical studies, notably in NMR spectroscopy such as proton NMR, carbon-13 NMR, deuterium NMR and phosphorus-31 NMR. Biochemical information can also be obtained from living tissue (e.g. human brain tumors) with the technique known as in vivo magnetic resonance spectroscopy or chemical shift NMR microscopy. These spectroscopic studies are possible because nuclei are surrounded by orbiting electrons, which are charged particles that generate small, local magnetic fields that add to or subtract from the external magnetic field, and so will partially shield the nuclei. The amount of shielding depends on the exact local environment. For example, a hydrogen bonded to an oxygen will be shielded differently from a hydrogen bonded to a carbon atom. In addition, two hydrogen nuclei can interact via a process known as spin-spin coupling, if they are on the same molecule, which will split the lines of the spectra in a recognizable way. As one of the two major spectroscopic techniques used in metabolomics, NMR is used to generate metabolic fingerprints from biological fluids to obtain information about disease states or toxic insults. By studying the peaks of nuclear magnetic resonance spectra, chemists can determine the structure of many compounds. It can be a very selective technique, distinguishing among many atoms within a molecule or collection of molecules of the same type but which differ only in terms of their local chemical environment. NMR spectroscopy is used to unambiguously identify known and novel compounds, and as such, is usually required by scientific journals for identity confirmation of synthesized new compounds. See the articles on carbon-13 NMR and proton NMR for detailed discussions. NMR) since its natural abundance is nearly 100%. Because the nuclear magnetic resonance timescale is rather slow, compared to other spectroscopic methods, changing the temperature of a T2* experiment can also give information about fast reactions, such as the Cope rearrangement or about structural dynamics, such as ring-flipping in cyclohexane. At low enough temperatures, a distinction can be made between the axial and equatorial hydrogens in cyclohexane. is the common isotope). However, in 1990 the spectrum was obtained by R. Taylor and co-workers at the University of Sussex and was found to contain a single peak, confirming the unusual structure of buckminsterfullerene. While NMR is primarily used for structural determination, it can also be used for purity determination, provided that the structure and molecular weight of the compound is known. This technique requires the use of an internal standard of known purity. Typically this standard will have a high molecular weight to facilitate accurate weighing, but relatively few protons so as to give a clear peak for later integration e.g. 1,2,4,5-tetrachloro-3-nitrobenzene. Accurately weighed portions of the standard and sample are combined and analysed by NMR. Suitable peaks from both compounds are selected and the purity of the sample is determined via the following equation. Nuclear magnetic resonance is extremely useful for analyzing samples non-destructively. Radio-frequency magnetic fields easily penetrate many types of matter and anything that is not highly conductive or inherently ferromagnetic. For example, various expensive biological samples, such as nucleic acids, including RNA and DNA, or proteins, can be studied using nuclear magnetic resonance for weeks or months before using destructive biochemical experiments. This also makes nuclear magnetic resonance a good choice for analyzing dangerous samples. In addition to providing static information on molecules by determining their 3D structures, one of the remarkable advantages of NMR over X-ray crystallography is that it can be used to obtain important dynamic information. This is due to the orientation dependence of the chemical-shift, dipole-coupling, or electric-quadrupole-coupling contributions to the instantaneous NMR frequency in an anisotropic molecular environment. When the molecule or segment containing the NMR-observed nucleus changes its orientation relative to the external field, the NMR frequency changes, which can result in changes in one- or two-dimensional spectra or in the relaxation times, depending of the correlation time and amplitude of the motion. Another use for nuclear magnetic resonance is data acquisition in the petroleum industry for petroleum and natural gas exploration and recovery. Initial research in this domain began in the 1950s, however, the first commercial instruments were not released until the early 1990s. A borehole is drilled into rock and sedimentary strata into which nuclear magnetic resonance logging equipment is lowered. Nuclear magnetic resonance analysis of these boreholes is used to measure rock porosity, estimate permeability from pore size distribution and identify pore fluids (water, oil and gas). These instruments are typically low field NMR spectrometers. The basic core and log measurement is the T2 decay, presented as a distribution of T2 amplitudes versus time at each sample depth, typically from 0.3 ms to 3 s. The T2 decay is further processed to give the total pore volume (the total porosity) and pore volumes within different ranges of T2. The most common volumes are the bound fluid and free fluid. A permeability estimate is made using a transform such as the Timur-Coates or SDR permeability transforms. By running the log with different acquisition parameters, direct hydrocarbon typing and enhanced diffusion are possible. Recently, real-time applications of NMR in liquid media have been developed using specifically designed flow probes (flow cell assemblies) which can replace standard tube probes. This has enabled techniques that can incorporate the use of high performance liquid chromatography (HPLC) or other continuous flow sample introduction devices. NMR spectra of refinery and petrochemical streams. The variation observed in these spectra with changing physical and chemical properties is modeled using chemometrics to yield predictions on unknown samples. The prediction results are provided to control systems via analogue or digital outputs from the spectrometer. In the Earth's magnetic field, NMR frequencies are in the audio frequency range, or the very low frequency and ultra low frequency bands of the radio frequency spectrum. Earth's field NMR (EFNMR) is typically stimulated by applying a relatively strong dc magnetic field pulse to the sample and, after the end of the pulse, analyzing the resulting low frequency alternating magnetic field that occurs in the Earth's magnetic field due to free induction decay (FID). These effects are exploited in some types of magnetometers, EFNMR spectrometers, and MRI imagers. Their inexpensive portable nature makes these instruments valuable for field use and for teaching the principles of NMR and MRI. Electron-mediated heteronuclear J-couplings (spin-spin couplings) are field independent, producing clusters of two or more frequencies separated by several Hz, which are more easily observed in a fundamental resonance of about 2 kHz. "Indeed it appears that enhanced resolution is possible due to the long spin relaxation times and high field homogeneity which prevail in EFNMR." Chemical shifts of several ppm are clearly separated in high field NMR spectra, but have separations of only a few millihertz at proton EFNMR frequencies, so are usually not resolved. In zero field NMR all magnetic fields are shielded such that magnetic fields below 1 nT (nanotesla) are achieved and the nuclear precession frequencies of all nuclei are close to zero and indistinguishable. Under those circumstances the observed spectra are no-longer dictated by chemical shifts but primarily by J-coupling interactions which are independent of the external magnetic field. Since inductive detection schemes are not sensitive at very low frequencies, on the order of the J-couplings (typically between 0 and 1000 Hz), alternative detection schemes are used. Specifically, sensitive magnetometers turn out to be good detectors for zero field NMR. A zero magnetic field environment does not provide any polarization hence it is the combination of zero field NMR with hyperpolarization schemes that makes zero field NMR attractive. NMR quantum computing uses the spin states of nuclei within molecules as qubits. NMR differs from other implementations of quantum computers in that it uses an ensemble of systems, in this case molecules. Various magnetometers use NMR effects to measure magnetic fields, including proton precession magnetometers (PPM) (also known as proton magnetometers), and Overhauser magnetometers. See also Earth's field NMR. Surface magnetic resonance (or magnetic resonance sounding) is based on the principle of Nuclear magnetic resonance (NMR) and measurements can be used to indirectly estimate the water content of saturated and unsaturated zones in the earth's subsurface. SNMR is used to estimate aquifer properties, including quantity of water contained in the aquifer, Porosity,and Hydraulic conductivity . Major NMR instrument makers include Thermo Fisher Scientific, Magritek, Oxford Instruments, Bruker, Spinlock SRL, General Electric, JEOL, Kimble Chase, Philips, Siemens AG, and formerly Agilent Technologies, Inc. (who own Varian, Inc.). Larmor equation (Not to be confused with Larmor formula). ^ a b D. I. Hoult, B. Bhakar, "NMR Signal Reception: Virtual Photons and Coherent Spontaneous Emission", Concepts Magn. Reson. 9, 277-297, 1997. ^ Rabi, I.I. ; Zacharias, J.R.; Millman, S. & Kusch, P. (1938). "A New Method of Measuring Nuclear Magnetic Moment". Physical Review. 53 (4): 318–327. Bibcode:1938PhRv...53..318R. doi:10.1103/PhysRev.53.318. ^ Filler, Aaron (2009). "The History, Development and Impact of Computed Imaging in Neurological Diagnosis and Neurosurgery: CT, MRI, and DTI". Nature Precedings. doi:10.1038/npre.2009.3267.5. ^ David Lee, W.; Drazen, Jeffrey; Sharp, Phillip A.; Langer, Robert S. (15 November 2013). From X-rays to DNA: How Engineering Drives Biology. pp. 161–162. ISBN 9780262019774. ^ a b c C. Cohen-Tannoudji, B. Diu, F. Laloe, Quantum Mechanics, Vol. 1, Wiley VCH, 1977. ^ R. P. Feynman, R. B. Leighton, M. Sands, The Feynman Lectures in Physics, Vol. 3. ^ a b A. Abragam, The Principles of Nuclear Magnetism, Ch. 2, Oxford Clarendon Press, 1961. ^ Vandersypen, Lieven M. K.; Steffen, Matthias; Breyta, Gregory; Yannoni, Costantino S.; Sherwood, Mark H.; Chuang, Isaac L. (2001). "Experimental realization of Shor's quantum factoring algorithm using nuclear magnetic resonance". Nature. 414 (6866): 883–887. arXiv:quant-ph/0112176. Bibcode:2001Natur.414..883V. doi:10.1038/414883a. PMID 11780055. ^ Brian M. Tissue (1996). "Nuclear Magnetic Resonance (NMR) Spectroscopy". Technische Universitaet Braunschweig. ^ "2nd Annual Practical Applications of NMR in Industry Conference (PANIC) Announced". Process NMR. 2014. ^ Derek Lowe (22 October 2010). "The Latest Technology". ^ Ryogo Kubo; Kazuhisa Tomita (1954). "A General Theory of Magnetic Resonance Absorption". Journal of the Physical Society of Japan. 9 (6): 888–919. Bibcode:1954JPSJ....9..888K. doi:10.1143/JPSJ.9.888. ^ Baianu, I.C. "Two-dimensional Fourier transforms". 2D-FT NMR and MRI. PlanetMath. Retrieved 22 February 2009. ^ "Chapter Nineteen Non-Medical Applications of NMR and MRI". Magnetic Resonance (11 ed.). June 2017. Retrieved 18 December 2017. ^ Taylor, R.; Hare, J.P.; Abdul-Sada, A.K. & Kroto, H.W. (1990). "Isolation, separation and characterization of the fullerenes C60 and C70: the third form of carbon". Journal of the Chemical Society, Chemical Communications. 20 (20): 1423–1425. doi:10.1039/c39900001423. ^ K. Schmidt-Rohr, H. W. Spiess, Multidimensional Solid-State NMR and Polymers, Ch. 2, Academic Press, 1994. ^ Kleinberg, Robert L.; Jackson, Jasper A. (1 January 2001). "An introduction to the history of NMR well logging". Concepts in Magnetic Resonance. 13 (6): 340–342. doi:10.1002/cmr.1018. ISSN 1099-0534. ^ Haner, R.L. & Keifer, P.A. (2009). Flow Probes for NMR Spectroscopy. Encyclopedia of Magnetic Resonance. doi:10.1002/9780470034590.emrstm1085. ISBN 978-0470034590. ^ Robinson J. N.; et al. (2006). "Two-dimensional NMR spectroscopy in Earth's magnetic field" (PDF). Journal of Magnetic Resonance. 182 (2): 343–347. Bibcode:2006JMagR.182..343R. doi:10.1016/j.jmr.2006.06.027. PMID 16860581. David M. Grant; Robin Kingsley Harris (2002). Encyclopedia of Nuclear Magnetic Resonance: Advances in NMR. John Wiley. ISBN 9780471490821. Gary E. Martin; A. S. Zektzer (1988). Two-Dimensional NMR Methods for Establishing Molecular Connectivity. New York: Wiley-VCH. p. 59. ISBN 978-0-471-18707-3. J.W. Akitt; B.E. Mann (2000). NMR and Chemistry. Cheltenham, UK: Stanley Thornes. pp. 273, 287. ISBN 978-0-7487-4344-5. G.M. Clore; A.M. Gronenborn (1991). "Structures of larger proteins in solution: three- and four-dimensional heteronuclear NMR spectroscopy". Science. 252 (5011): 1390–1399. doi:10.1126/science.2047852. PMID 2047852. J.P. Hornak. "The Basics of NMR". Retrieved 23 February 2009. J. Keeler (2005). Understanding NMR Spectroscopy. John Wiley & Sons. ISBN 978-0-470-01786-9. Kurt Wüthrich (1986). NMR of Proteins and Nucleic Acids. New York (NY), USA: Wiley-Interscience. ISBN 978-0-471-11917-3. J.M. Tyszka; S.E. Fraser; R.E. Jacobs (2005). "Magnetic resonance microscopy: recent advances and applications". Current Opinion in Biotechnology. 16 (1): 93–99. doi:10.1016/j.copbio.2004.11.004. PMID 15722021. R.L. Haner; P.A. Keifer (2009). "Flow Probes for NMR Spectroscopy". Encyclopedia of Magnetic Resonance. John Wiley. doi:10.1002/9780470034590.emrstm1085. ISBN 978-0470034590. Wikimedia Commons has media related to Nuclear magnetic resonance. Richard Ernst, NL – Developer of multidimensional NMR techniques Freeview video provided by the Vega Science Trust. 'An Interview with Kurt Wuthrich' Freeview video by the Vega Science Trust (Wüthrich was awarded a Nobel Prize in Chemistry in 2002 "for his development of nuclear magnetic resonance spectroscopy for determining the three-dimensional structure of biological macromolecules in solution").